James Taylor presents an introduction to history and context surrounding the instantly recognisable and highly popular posters used in the UK for various propaganda purposes during World War I and II. 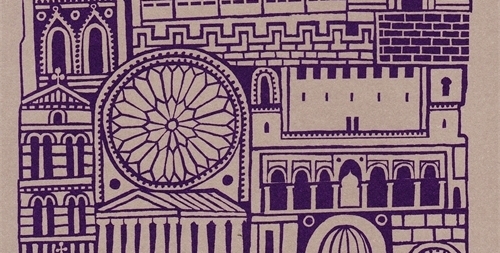 We also showcase three Scottish poster designs. 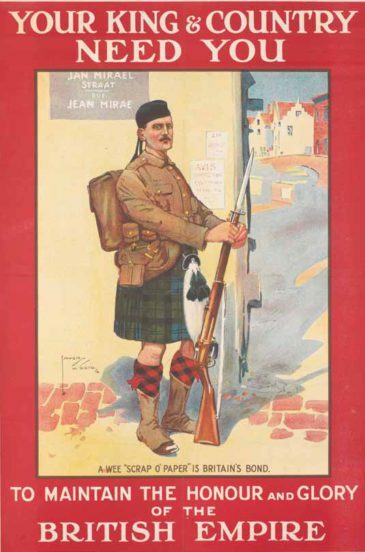 This book coincides with the global centenary commemorations of World War I and it reveals, for the first time, the true story and full extent of the vital role played by the art and design of recruitment posters in the war – not just in the UK, but around the world in Europe, Australia, Canada, India, South Africa and the USA. The posters were particularly important during the initial stages of the conflict, when they were devised as part of a wide-ranging campaign to recruit the millions of men needed for frontline action. 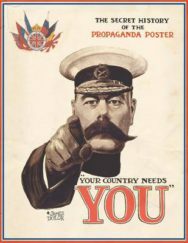 Today, one poster above all others is recollected by name: Your Country Needs YOU. It is a poster that we all feel we know so well, but do we really? There is no doubting the enduring influence of the striking, arm-stretching and finger-pointing cartoon of Lord Kitchener first created by the British-born commercial artist Alfred Leete as the cover for London Opinion magazine on 5th September 1914. The original artwork for this cartoon was acquired by the Imperial War Museum in 1917 and has ever since been mistakenly assimilated into the minds of millions as being one and the same as an imagined recruitment poster bearing the same slogan with mass appeal. But was this poster really as popular as people now think? There is certainly evidence that the image of the cartoon – as opposed to the poster – was very popular. For example, London Opinion, which sold more than a quarter of a million copies a week in the early months of the war, issued reproductions of the cartoon on fine art paper. Postcards bearing the image are also thought to have appeared in order to aid recruitment. The popularity and success of the Kitchener cartoon lies in its combination of an easy-to remember slogan and a simplistic and adaptable design that derived from commercial advertising pre-dating the war. However, there is no conclusive evidence to support the claims made by many historians that a poster version of Leete’s cartoon was the most popular and effective official design of the war. A list of the official posters in order of popularity has been compiled here and Leete is conspicuous by his absence. Leete’s poster was published privately and no records survive of the precise numbers printed. As well as examining the story of Leete’s Kitchener image, this book delves into the remarkable life and achievements of Leete himself, and explores the influence of cartoonist contemporaries such as Bruce Bairnsfather (creator of ‘Old Bill’) and John Hassall (Skegness Is So Bracing), alongside the colourful and controversial world of the brilliant American artist, cartoonist and illustrator James Montgomery Flagg. In 1917, Flagg adapted Leete’s design for his celebrated poster depicting Uncle Sam. Entitled I Want YOU For U.S. Army, it is arguably the most familiar image in the USA after the ‘Stars and Stripes’ national flag. The designs of both Leete and Flagg still resonate powerfully today and have been used for many diverse campaigns for economic, educational, financial, military and political purposes during World War II and in the following decades up to the present day. They have become design icons.